The iShoe insole has been developed by Erez Lieberman, an MIT graduate student working for NASA. It could help doctors detect balance problems before a fall. Lieberman, a graduate student in the Harvard-MIT Division of Health Sciences and Technology, is now testing the device with a small group of patients. The current model is equipped to diagnose balance problems, but future versions could help correct such problems, by providing sensory stimulation to the feet when the wearer is off-kilter. "By doing that we can replace the sense and thus improve people's balance," Lieberman says. The technology was originally developed so that NASA could monitor balance problems in astronauts after they had returned from space. Zero gravity environments are tough on the vestibular system, which is one of the three systems that help a person maintain their balance. The other two are vision and the sensory receptors that maintain your sense of proprioception, where your body parts are in relation to each other. NASA astronauts are tested for 16 days following their return from space; problems with balance have typically affected astronauts for up to ten days. "We've developed the first algorithm that is really capable of not just looking at the pressure distribution of proprioceptors on the feet but also analyzing what that's saying," he says. After Lieberman's own grandmother suffered a bad fall several years ago, he theorized that a balance diagnostic tool could help doctors catch balance problems early. 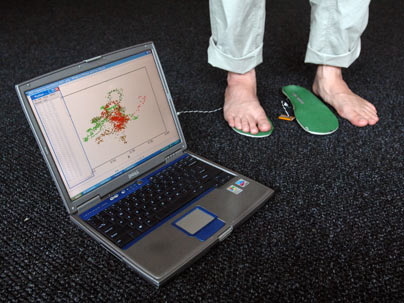 The iShoe insole measures and analyzes the pressure distribution of the patient's foot; this data could be used to provide the patient's doctor with better information about balance and even to alert family members if a fall has occurred. Science fiction fans have probably heard of the magnetic-soled shoes from Murray Leinster's Space Tug (1953) or the digital running shoes from Bruce Sterling's Islands in the Net (1988). But feet can obviously provide more data. Ideally, the iShoe insoles would be powered by foot motion; see the stillsuit desert boots for some of Frank Herbert's early thoughts about how it might be done.